With gratitude to Sheriff Roland, who first introduced us to the "I LOVE everything Ennis" thread and the "I LOVE everything Jack" thread, I herewith start the "I LOVE everything Heath" thread. I love how he often opened his home to friends to stay with him, and was quick to offer to make someone a meal. I love his quick moves and anxiety when he was interviewed on public and talk shows. I love his sartorial and tonsorial choices, especially at fancy awards events. I love how he taught me these two new words. I love him for being himself. I love his doting to Matilda. I love the special touches he brought to the character of Ennis: his "chewing" and spitting, his "huhs" and "hunhs" (see below) and especially, his reversal of the shirts (Jack's sheltering Ennis's when first seen, Ennis's sheltering Jack's when last seen). TWENTY OF 'EM!! (I just brought this over with us from IMDb so everyone feels a little more at home). 1) 00:16:40 Yeah, and what if Aguirre finds out, huh? 2) 00:20:28 If you don't get stomped winnin' it, huh? 3) 00:36:09 Well, what're we supposed to do now, huh? 4) 00:36:36 What if we need work from him again, huh? 5) 00:37:56 Well, that snow barely stuck an hour. Huh? 6) 00:38:14 I don't need your money. Huh? 7) 00:42:03 Well, I guess I'll see you around, huh? 00:43:18 What the f uck you lookin' at? Huh? 9) 00:49:00 I'll bet you could fix this place up real nice if you wanted to. Hmmm? 10) 00:49:39 This ain't so lonely now, is it? Hmmm? 11) 00:53:11 What about it? You wanna lose about half yer f uckin' teeth? Huh? 13) 01:16:29 Well alright, long as I don't have to sing. Hmmm? 14) 01:20:04 What're you doing here, huh? 15) 01:41:42 You probably deserve it, huh? 16) 01:44:51 Jack, I gotta work. Huh? 17) 01:45:48 You been to Mexico, Jack Twist? Huh? 19) 02:03:47 He's a roughneck, huh? I love Heath for his stunning character portrayals -- even without "actor" training. He was more "being" than "acting". I love Heath because he carried Matilda on his shoulders. I love Heath with the beautiful eyes. I love Heath for eschewing the wild Hollywood lifestyle. I love Heath for the Aussie accent. 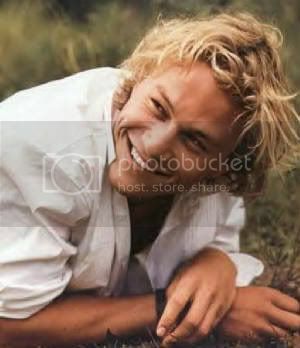 I love Heath because of his sometimes shyness. I love Heath for Heath. I love Heath for being a nice guy, for being fidgety, for being tall, for not matching, for his devotion to his daughter, for choosing a different path, for marching to the beat of a different drummer, for sharing himself with us. I love Heath because he was considerate. Months later, I learned that as Heath left the set that night, he quietly thanked each crew member for working late. Quietly. Not trying to make a point, just grateful for the chance to create that they'd given him. 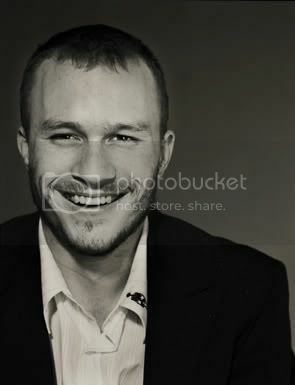 I love Heath becasue he was human in a lifestyle where its hard to be. And for being such a considerate guy - Shasta you beat me to it with this quote. I love Heath because he was true to himself. I love Heath for helping me find Bettermost. I love Heath because he loved his baby Matilda Rose. I love Heath because I am a Heathen. Yesterday-cold and rainy-I drove to L.A. to be with a friend as she scattered her father's ashes. We hiked down to a river, which is normally dry but because of the rain was flowing heavily. Each of us was given a rose to throw into the water with out thoughts. I plucked the petals off of mine and with each whispered a reason I love Heath. 10 Things I Love About You I threw my petals into the water and with the small bud remaining I thanked him for giving me all of you. thank you, RouxB, for that - hope you are ok! I love Heath for his kooky fashion sense. I love Heath for giving us perfomances that we can now forever treasure. I love Heath for putting Matilda and Hugos(intentional or accidental?) feet prints in cement. I LOVE Heath for having a tattoo of his mother's and sisters' initials on his wrist. I love Heath for his skittishness, for his fidgeting and his shyness. I love Heath' deep rumbling voice. And how I love his brown, soulful eyes. I love Heath for his love for stripes. 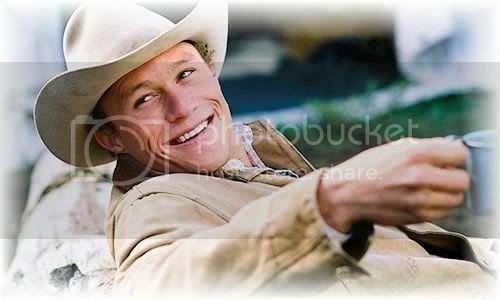 I love Heath for incarnating Ennis Del Mar. I love Heath for understanding Ennis so perfectly. I love Heath for wearing old, worn shoes to red carpet events. I LOVE Heath for winking at that fella to help the hotelier get his business. I love Heath for throwing himself completely into every role. I love Heath for his absolute love and affection for Matilda. I love Heath for his nervous fidgeting in interviews. I love Heath for playing chess in the park with strangers. I love Heath for remaining true to himself through it all. I LOVE Heath for preparing to become a director. I LOVE Heath for being such a wonderful father. That is one of my superfavorite pictures. The tenderness! The beauty! I love Heath for saying "Breathe, Lukey, breathe." I LOVE Heath for inspiring so many people to leave such wonderful tributes at his apartment. I love Heath for his range. From 10 Things to Brokeback is quite a leap, and he did it beautifully. I love Heath for his unique taste in fashion. I love the stripes, too. And silly hats. I love Heath for his courage and integrity as an actor. Going against the grain, refusing to give in to one's image...that takes guts. I love how earnest he was. I love Heath because he dared, because he lived his life listening to his heart. I love Heath because he throws himself 100% into everything he does. my first and last fangirl love affair. I love Heath for awkening something in me that I had thought was long since gone. I wish he had stayed around longer, I feel so bereft and deprived.